Today , on 24th of September 2014, India became the 4th and the Asia’s first country who reached on Mars as it’s Mars Orbiter Mission spacecraft, also known as Mangalyaan, successfully entered into orbit around the Red Planet. Also India is the first country that successfully completed it’s Mars mission in first attempt. ISRO reported that probe successfully executed it’s 24 minutes engine running process. Prime minister Modi congratulated the scientist and the whole country on this proud occasion. India’s Mars mission started taking shape back on October 22, 2008 with the success of India’s Chandrayaan- 1 ( Moon mission ) . On August 2010 a working committee suggested that India is capable of sending a Mars mission. It was a valor decision knowing that majority of failed Mars mission of other countries. On 3rd of august 2012 central cabinet gave green signal to this mission. This approval was just before 96 hours of NASA’s successful landing of it’s curiosity rover. The total budget of India’s mars mission is 450 crore rupees. This amount is 10 times less than American mars mission. Even less than Hollywood movie “Gravity” budget, PM Modi said. This is near about half budget of making a Boeing 787. Mars Orbiter Mission spacecraft : Hindustan Aeronautics Limited made the Mars Orbiter. 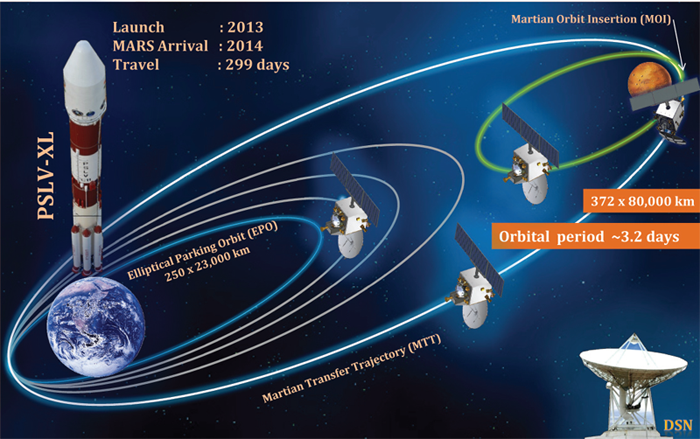 2012 made this spacecraft took three months to complete. The cost of the spacecraft is less than 10% of the entire Mission. Spacecraft launch weight is 1350 Kg , Payload mass is 15 Kg and it’s made of Aluminium and Carbon Fiber. The spacecraft is entirely made by India. Payload : It have five payloads for studying environment, particles and surface imaging.